If you are the person responsible for travel planning in your household, you may have already discovered “smart” travel search websites like Farecast.com or Kayak.com. These sites are not online booking engines. Instead, they help users find the best available option for flights, car rentals and hotels by searching across many other websites (the technical term is meta-search engine). Although you may think the amount of data returned from such a search would be just too much to display comprehensibly, both sites are downright fun to use. I particularly like the prediction indicators on Farecast. As a dedicated travel junkie, I thought I should subscribe to a newsletter from one of these websites at least for a little while to see if this new technology could really help me. I chose Farecast for no other reason than it’s a Seattle-based company & I’m a Seattlite. Well, when I received my very first email from them, I was blown away. The topic of the email was “Search for Summer Trips Today”. 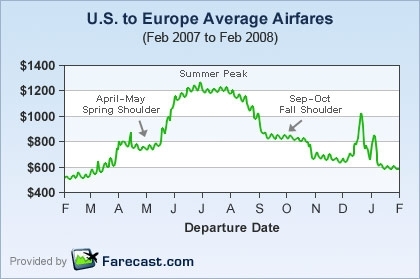 The email included a chart of average airfares between the U.S. and Europe from Feb 2007 to Feb 2008. The chart is also posted on the Farecast blog. From experience I “knew” that flying to Europe was more expensive at peak times (July, August & Christmas) than at off-peak times; and that I could usually get pretty good prices in April/May and sept/Oct. If Farecast’s data is correct, the seasonal differences in airfares are nothing short of stunning. As John Rauser, the author of the Farecast blog posting referenced above says: “for travel to Europe in the Summer, youâ€™re looking at paying a 150% premium, or two-and-a-half times more than in Winter”. Since Farecast caught my attention with this newsletter, I’ve become a travel meta-search website junkie. When searching for flights, I highly recommend you start your search at one of these websites. You’ll get flight choices from booking engines and airline websites you may not have thought to check. But, I do have a comment for the fine folks at Farecast who sent out a summer trip planning newsletter in March. I booked the flights for my family’s trip this coming June in January. I paid $200 less per person than the best flight I could find using Farecast today (April 1st). For a family of four, that’s an $800 saving. Perhaps next year you could send out your trip planning email a little earlier ? This entry was posted in Mom Talks Tech and tagged Airfare Seasonality, Farecast, Flying on April 3, 2008 by wandermom.